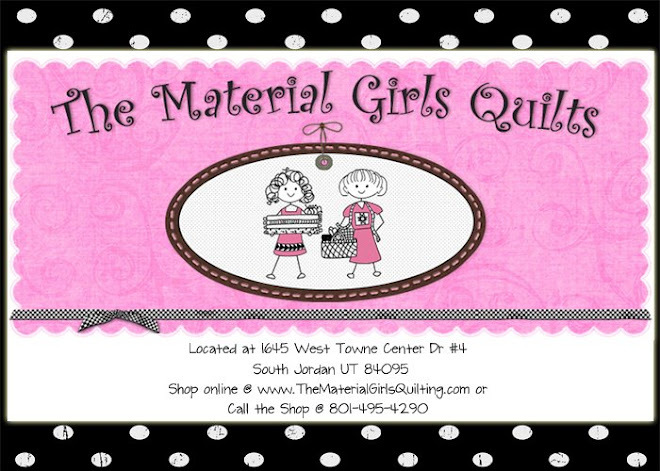 This is just a short note to let you all know, that you can become a fan of The Material Girls Quilts on facebook! I swore I wasn't going to buy into all that but here I am. 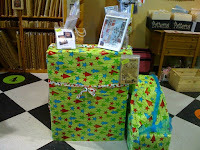 So hop on over to facebook and become a fan of the Material Girls Quilts. We are going to have a prize giveaway over there, we will probably do one here too! So stayed tuned its a good one!! This is a new line from Free Spirit call Little Houses, it is so cute my pictures don't do it justice. Light pinks, blues and greens with a dab of lavender, very shabby chic! 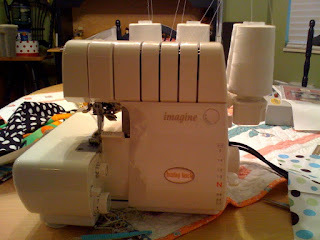 I am off to sew project number 3!!! yahooey! I know its early for a Halloween post.....but, this is such a cute tablesquare by Ashby's Attic. We have the cutest Halloween prints in~Trick or Treat Street, Spooktacular, Punkin Peers to name a few. 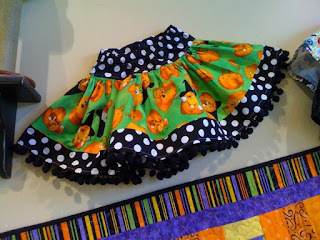 Oh and lets not forget that cute skirt I finished out of Halloween fabrics. You are going to have to hurry though they are moving fast. Okay, I am such a sucker! I caved and bought a Serger, (I have one but threading the thing was pretty much impossible, not to mention I can't find the foot pedal or the manual!!!) My daughter Shelby is on this kick of making skirts! One of my customers has made her 2 and I think she was tired of sewing for her, (Shelby can be very persuasive) so last Saturday she spent the day at the shop helping Shelby do it by herself (thanks Laurie) So..., on Monday off we trot to look at them and ended up coming home with this! I haven't got the hang of it yet, but I have played on it, and now I think I need to make a skirt for the shop. Is that before or after I finish the other zillion projects I have going? I really thinks she needs a name, any suggestions? 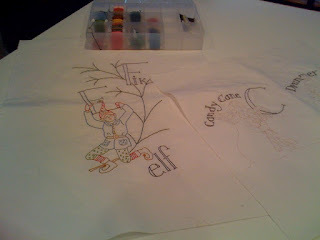 So, I am off to work on one of Pink Figs skirt patterns!! How cute is this?! 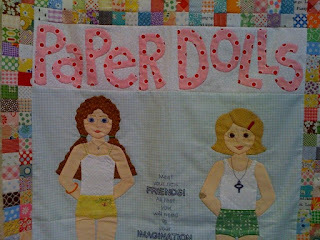 This is the new block of the month from "Bee in my Bonnet" called "Paperdolls" I love it! I haven't seen the whole quilt yet, but trust me it will be amazing. (It's not too late to sign up, so just give the shop a call 801-495-4290) We carry all of her patterns and they are all just as fantastic! 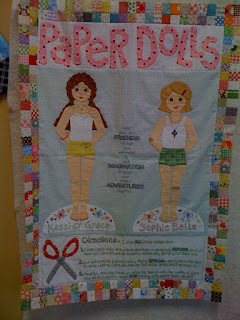 I have a thing for paperdolls, (I think it is because as a kid my little sister Bev would destroy them, she might have issues, she also cut all the hair off of the Barbie's!) and so this quilt speaks to me. oh! wait! maybe I have issues ~ all fabric speaks to me. 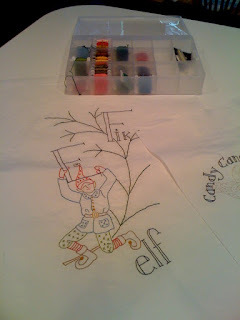 Be sure and check out Lori's blog http://www.beeinmybonnet.blogspot.com/ So, girls its time for me to do my nightly stitching! I'll be showing my progress soon! Jingle bells in July?! 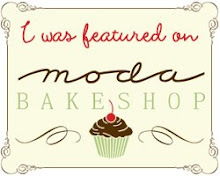 I know its early ladies but......, its time for our Christmas in July event! 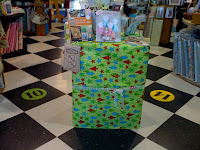 We have wrapped up some of the new lines ready to be unveiled on Friday July 10 and Saturday July 11. We have loads of new projects ready for you to start and get finished in time for the big Season! 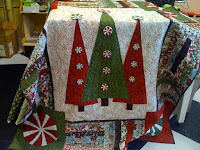 We will have new quilts and projects up just for this event. The stitchery is one of Crabapple Hill's newest patterns (just love her designs) that I have started and am going to finish it. It is going slower than I had planned, but I am back on track again! (now, I need to leave that darn Kindle alone! Wendy it's all your fault you showed me yours!) There will be drawings, games and a whole lot of fun!! But, we Material Girls are just a fun bunch!! So load up the sleigh (jk) and come on down!! 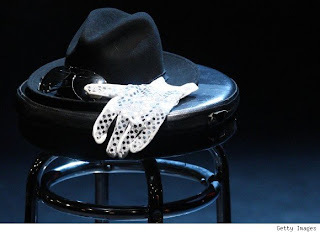 Goodbye MJ, King of Pop! Goodbye Michael! may you rest in peace. Your music an dance moves will live on for generations! Just want to wish all of you a safe, happy, fun~filled Fourth of July!! 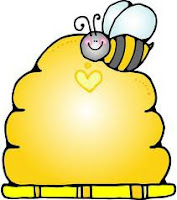 I have lots to tell you so stayed tuned my friends! !